Graham Shanks opened up discussion of an unidentified portrait, by asking for evidence (other than anecdotal) that the subject was Drummer Roddick. The question was then raised as to whether it could instead relate to the artist Sir George Reid, whose house the painting resides in. Martin Hopkins quickly dismissed the connection to Reid, pointing out the difference between the signature in the top left hand corner of this work and the one seen on other works attributed to Reid. Discussion of the signature continued with Oliver Perry suggesting that it held visual similarities to that of Walter Graham Grieve. Pieter van der Merwe agreed that the signature comparison seemed convincing, and suggested a similarity between the subject of the painting under discussion and the figures of older bearded men in Grieve’s The Cribbage Players. 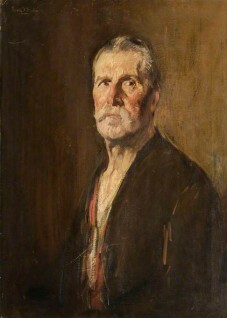 Osmund Bullock agreed that both Pieter’s and Oliver’s suggestions seem to be highly likely, pointing out that Roddick was working as an artist’s model in Edinburgh around the same time that Grieve resided in the city. Evidence becomes more convincing when Oliver Perry found an old picture of Roddick taken from a catalogue entitled ‘Master Weavers – Tapestry from the Dovecot Studios 1912–1980’. It was overwhelmingly agreed that the portrait in question and printed picture without a doubt depict the same man. With this final discovery, it was decided that, in the absence of contradictory evidence, it should be accepted that this portrait is Study of Drummer James Roddick (1848–1928), 92nd Gordon Highlanders, in Old Age, attributed to Walter Graham Grieve. Could this be Drummer Roddick? Or is this portrait related to Sir George Reid?